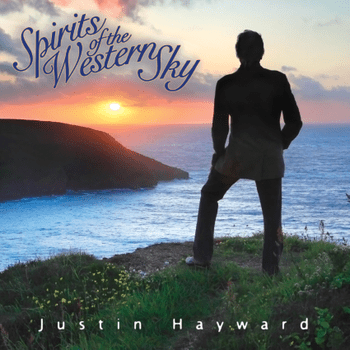 CD Review: Justin Hayward, "Spirits Of The Western Sky"
Moody Blues frontman is back with a solo effort. I think we need to face the fact that there isn’t going to be a full-scale Moody Blues reunion in the studio, certainly not on new material. They still make the touring rounds, at least in part (Justin Hayward, John Lodge and Graeme Edge — no Ray Thomas). What this means is that when you approach Justin Hayward’s Spirits Of The Western Sky, you need to do so with lowered expectations not based upon a quality level but on the order that this isn’t going to be a Moody Blues record. In terms of that quality level, Hayward has always possessed a great ear for melody and has one of those blessed voices that, many decades on and a lot like Steve Winwood, shows little to no signs of time’s tolls. The ride you go on with this recording is mostly a pleasant one, excepting the afterthought that is the EDM version (in two mixes) of “I Know You’re Out There Somewhere,” brought here as “Out There, Somewhere.” The less said about that, the better and so let’s forget it exists from here on out. Spirits Of The Western Sky is not the full-on bluegrass album people were worried about, and even during the Moodies the sounds of pedal steel and twang found their way into the work as did almost everything else. People fearing a complete tonal shift should not get too worked up by what they find. Hayward does hit those Americanized “R” (sounding like: arrr!) sounds a little harrrrd, but even at that I was pleasantly surprised by the disc. But therein lies a problem. I never quite moved from pleasant surprise to that moment where I thought this was the record I had been waiting for for so long. I think I know why. There is a well-balanced match that existed between the Moodies. Hayward had the romantic, melancholy side nailed down; John Lodge brought a rocker or two; Thomas and Egde brought social conscience and a bit of Celtic folk into it (which really is influenced by the presence of flute), and all the parts kept the other parts from going off-kilter. The weakest of the Moodies records were primarily because of that lack of balance. So it is that Hayward’s solos (and to be fair, Lodge’s solos suffer the same fate) haven’t something else to bounce off of, and when that alternate feeling is artificially introduced, it doesn’t sound right. Fortunately Hayward doesn’t try to put on a rocker-man facade here, and even if the release sounds too romantic and too melancholy by turns, its sounds are suited to Hayward’s strengths. I agree with several other reviewers that the backing tracks sound a bit tinny and sample-originated, and I wish that the means had been there for a fuller, gutsier room of session artists to lift the songs, but that is not to leave people thinking Justin is singing along with a Casio preset. The songs sound good. They might have sounded even better. You’ll have to wait for the tour to know for certain. I would not dissuade potential purchasers from buying this CD. It is great to have Hayward back, doing what he does best on new material. But this recording requires one to be realistic about what they are receiving. If they do so, they will likely appreciate Spirits Of The Western Sky a lot…they just need to turn the thing off before those last two tracks. That’s just some friendly unsolicited advice.